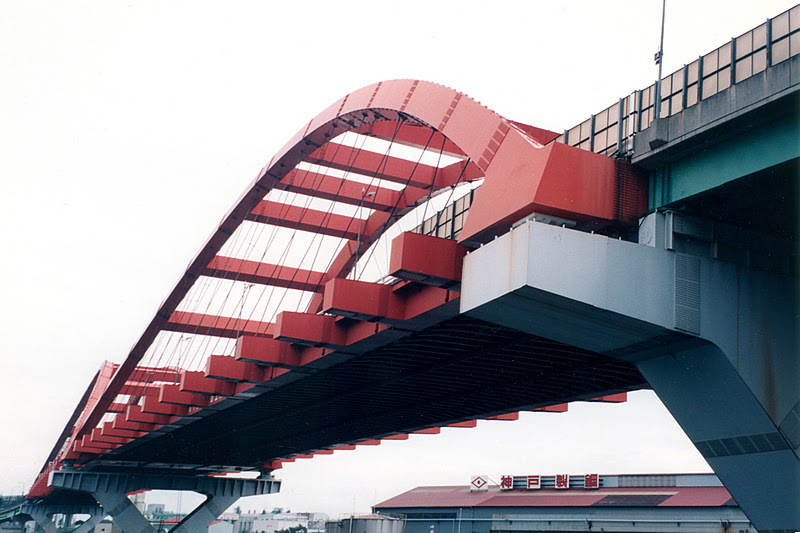 With its bright red arches and Y-shaped blue bents, the Nada Bridge is almost cartoonish in appearance. Note how the bents are attached to reinforced concrete pile caps. I never heard of any damage to this bridge from the 1995 Kobe earthquake, which considering the amount of soil liquefaction and damage to port facilities in the area is pretty remarkable. Osaka Bay Bridges: Nada Bridge (2) by Mark Yashinsky is licensed under a Creative Commons Attribution-NonCommercial-ShareAlike 3.0 United States License.